But next year we are going to add some something extra to our time in the farmhouse. Back in 2007 we went to Paris and although I enjoyed seeing the Eiffel Tower and The Louvre, like any Disney nut, I wanted to go to Disneyland, Paris (DLP). As we were only in France for a few days we just did not have time, so I consoled myself with a visit to The Disney Store. However, my in-laws have suggested that in 2012, we have a dry run for our WDW trip in 2014, the first with Tink who will be 2.5 years when we go to DLP and just over 4 when we go to WDW. So, we'll be spending some time at DLP during our annual trip across The Channel. Although the planning will not be quite as intrinsic as a Trans-Atlantic jaunt, there are still many things to look into and decisions to be made, as although Euro Disney, now known as DLP has been around for over 15 years, I have yet to visit. As you may have realised from former posts, I don't just love Disney, I ADORE the USA. Therefore I'd much rather get my Mickey fix by travelling to Florida. However, finances again have reared their ugly head, meaning that belts must be tightened and the almost yearly trip across the pond will be on a hiatus until 2014. Anyway, back to DLP. When should we go? We usually take our family holiday the 2nd week of July to coincide with Bastille Day on July 14th, known as Fete National in France. But when should we fit our "vacation within a vacation" in? Because it takes over 4 hours to travel to Paris from the farmhouse in Doussac, it would need to be at either the beginning or end of the trip. How long do we stay? It's too far to do as just a day trip, but would two days and one night be enough with travelling too? Where should we stay? I'd love to stay on-site, but the hotels are quite expensive and the rest of the family won't be too bothered by the theming. I'm hoping to persuade them about the location, and therefore show time saving and less walking/driving to and from. Where will we eat? The French don't have a lot of choice for a veggie usually. Is it worth doing both Parks with a toddler? DLP has Disneyland Park which is similar to the Magic Kingdom and Walt Disney Studios, like Hollywood Studios. Be sure to check in as I work through these choices and progress with my planning in greater detail. I will be sharing my thoughts and taking you through my decision making process. 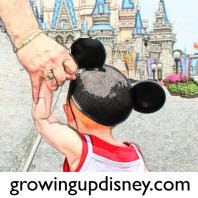 I hope that you'll enjoy learning about DLP as much as I will, and please feel free to leave any comments or advice on the blog. Contributed by Janine P. of Swindon, England. She is a proud wife, mommy to Felicity and one of our Minnie Moms. Photo Flashback! More of the "Little Things"